Before operating the Voxel8 Developer's Kit printer you should always keep in mind your safety and the safety of those around you. Below are some basic guidelines and procedures you should adhere to when using your printer. DO NOT LOOK INTO THE LASER ON THE VOXEL8 DEVELOPER'S KIT PRINTER. THE VOXEL8 PRINTER HAS MANY MOVING PARTS THAT MAY CAUSE INJURY. DO NOT OPEN THE CLEAR LID COVER WHILE MACHINE IS IN OPERATION. DO NOT TOUCH THE PRINT HEAD CARRIAGE WHILE IT IS IN MOTION. STAY CLEAR OF THE FANS INSIDE OF THE PRINTER. THE PRINTER OPERATES AT HIGH TEMPERATURES. ALWAYS BE CAREFUL AROUND THE NOZZLE, FRESHLY EXTRUDED MATERIAL, AND THE BUILD PLATE DURING AND AFTER THE PRINTER OPERATION. ALWAYS WAIT FOR THESE ITEMS TO COOL BEFORE TOUCHING THEM. THE PRINTER OPERATES WITH AIR PRESSURE DURING MULTI-MATERIAL PRINTS. YOU SHOULD ALWAYS CHECK THE PNEUMATIC HOSE BEFORE PRINTING; ESPECIALLY IF YOU ARE SUPPLYING YOUR OWN "HOUSE AIR" TO THE MACHINE DURING OPERATION. WHENEVER WORKING WITH THE MACHINE IT IS A GOOD IDEA TO GROUND YOURSELF PRIOR TO OPERATING THE MACHINE; ESPECIALLY IF YOU ARE IN A CARPETED AREA. WHENEVER WORKING WITH ANYTHING INTERNAL TO THE MACHINE YOU SHOULD BE WEARING AN ANTI-STATIC WRIST STRAP; ESPECIALLY ELECTRONICS. POWER OFF THE MACHINE AND UNPLUG THE PRINTER BEFORE ATTEMPTING ANY REPAIRS ON YOUR OWN. 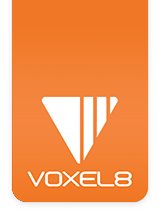 CONTACT VOXEL8 SUPPORT IF A PROBLEM EXISTS THAT REQUIRES YOU TO OPEN UP THE MACHINE. USE THE POWER CABLE THAT WAS SUPPLIED WITH YOUR VOXEL8 MACHINE. DO NOT EVER USE A DIFFERENT AC POWER CORD WITHOUT A GROUND. NEVER UNPLUG THE MACHINE BY PULLING ON THE END OF THE POWER CORD. ALWAYS GRASP AND REMOVE THE POWER CORD FROM CONNECTOR. DO NOT ALLOW THE POWER CORD TO BE CRIMPED, PINCHED, STEPPED ON, ETC. MAKE SURE THAT YOUR VOXEL8 POWER CABLE IS NOT A TRIPPING HAZARD IN THE AREA YOU HAVE IT SETUP IN. THE SDS (SAFETY DATA SHEETS) FOR THE CONDUCTIVE SILVER INK AND THE WIPING SOLUTION THAT SHIP WITH YOUR DEVELOPER'S KIT ARE LOCATED HERE. WE RECOMMEND YOU READ BOTH ENTIRELY, BEFORE PRINTING. RUN THE VOXEL8 PRINTER IN A WELL VENTILATED AREA, SINCE PLASTIC FILAMENTS CAN EMIT ODORS DURING OPERATION. WHEN PRINTING WITH THE SILVER, IT IS RECOMMENDED TO WEAR DISPOSABLE GLOVES WHEN HANDLING THE SILVER INK BARREL SYRINGES. YOU SHOULD ALSO WASH YOUR HANDS AFTER HANDLING ANY MULTI-MATERIAL PRINTS THAT CONTAIN SILVER. DO NOT PLACE THE PRINTER NEXT TO A HEAT SOURCE SUCH AS A HEATING VENT OR OTHER ITEM THAT GENERATES SIGNIFICANT THERMAL ENERGY. DO NOT EXPOSE THE PRINTER TO WATER OR MOISTURE. DO NOT PLACE DRINKS OR OTHER LIQUIDS ON OR NEAR THE PRINTER. IF WATER GETS ON THE PRINTER, IMMEDIATELY UNPLUG FROM THE POWER OUTLET AND THEN COMPLETELY DRY IT BEFORE POWERING IT BACK ON. THE VOXEL8 PRINTER SHOULD BE OPERATED BY ADULTS, OR UNDER SUPERVISION. IT IS RECOMMENDED TO BE PRESENT DURING MACHINE OPERATION. ALTHOUGH IT IS POSSIBLE FOR YOU CAN SETUP A CAMERA WITH THE VOXEL8 CONTROL INTERFACE TO MONITOR YOUR PRINTS REMOTELY. DO NOT EXPOSE THE PRINTER TO EXCESSIVE VIBRATIONS; ESPECIALLY DURING THE BUILD PLATE LEVELING AND NOZZLE ALIGNMENT PROCEDURES WHICH REQUIRE VERY SENSITIVE LASER READINGS. IN THE EVENT OF A SERIOUS OPERATING ISSUE, TURN OFF/UNPLUG THE PRINTER AND STOP USING THE UNIT. CONTACT VOXEL8 SUPPORT FOR NEXT STEPS. WHEN REMOVING PRINTED PARTS FROM YOUR VOXEL8 PRINTER, BE AWARE THAT BOTH THE PRINT CARTRIDGE HEAD AND HEATED BUILD PLATE MAY STILL BE HOT. BE CAREFUL REMOVING PRINTED PARTS FROM YOUR VOXEL8 PRINTER WHEN USING A SHARP EDGED TOOL. IT MAY RUIN YOUR DAY. In addition, like all industrial pieces of hardware equipment; it is best to treat it with both care and respect to prolong its longevity. NOTE: Refer to the Maintenance page, later, for more information about how to take care of your Voxel8 Developer's Kit printer.